Set between expansive beaches and small ports, the centers of thalassotherapy (seawater therapy) benefit from the fresh ocean air and especially from the virtues of seawater, as well as those of algae and mineral muds. Wind, waves and rocks: the shores of Brittany seem to be at odds with the rugged elements. In fact, they benefit from the ocean’s generous nature. The antibacterial qualities of the phytoplankton in sea water, the analgesic healing properties of marine muds, and the mineral components and trace elements of algae, all contribute to the health of our bodies. Already appreciated by the Romans and especially developed–scientific evidence in hand–in the 1960s, thalasso is no longer confined to the narrow notion of medical care. It is now also seen in terms of fitness and beauty and more broadly, holistic wellbeing and health. 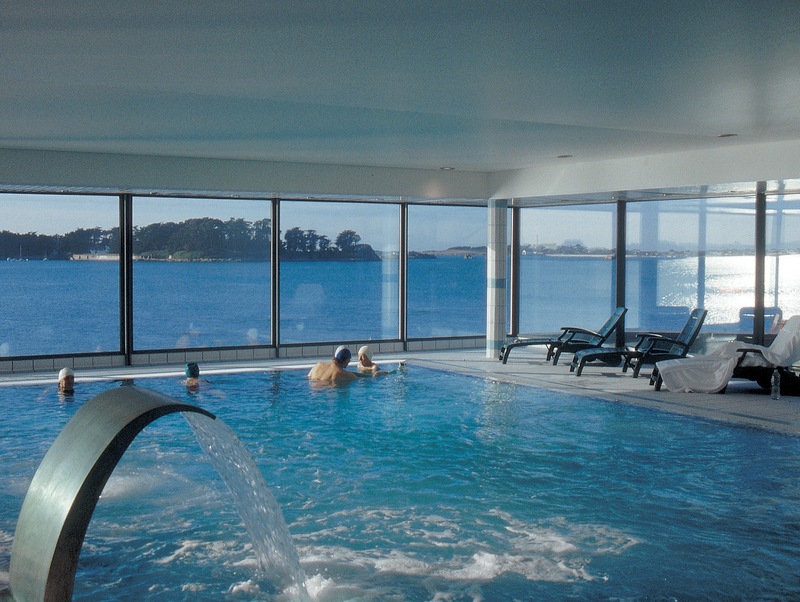 Thalassotherapy is now considered a vacation destination because of its appealing and enticing environment. Pioneering in the field and boasting today one fifth of centers that now exist along France’s shores, Brittany is also a major place of interest in its own right. Locations from la Baule to Saint-Malo speak for themselves. Dinard, with its unique « Second Empire » style of opulant villas with ornamented turrets, half-timbering and luxuriant gardens, reminds one that this vacation destination was highly prized by Europe’s high society and notables of the time, especially by artistocrats and artists. In the 1860s, the « baths » were a rather elite activity and defined the elegant atmosphere of the first seaside resorts. Much less elitist today but treating each guest like a VIP, modern thalasso partners the benefits of diet and relaxation to the treatment. Thus, the « privateer city » of Saint-Malo, with its impressive fortifications and ramparts, 17th century homes and its restored historic district, also resounds with the call of the sea. Elsewhere, sightseeing and strolling opportunities abound from the famous pink granite rocks near Perros-Guirec or the charming port and of Bénodet (which was so cherished by Eric Tabarly), to the must-see megalithic monuments (alignments, tumuli, dolmens) of Carnac and the immense crescent-shaped beach of Baule-les-Pins, a touch of « Riviera » on the Brittant coast. A thalassotherapy spa stay also means experiencing the nuanced precepts of the Eastern alternative medicines, that are adapted to each individual. Weight-loss or stress-reduction stays and other invigorating care, meet the needs of people from every walk of life, from moms and seniors, to men in the prime of their life. But a thalasso spa sojourn is also an occasion to visit the surrounding areas and to discover local treasures.